20-year-old Sebastien (Georges Babluani) leads an impoverished life with his immigrant family constantly struggling to support them. While repairing the roof of a neighbor's house, he overhears a conversation about an expected package which promises to make the household rich. Sensing the opportunity of a lifetime, Sebastien intercepts the package which contains a series of specific instructions. Following the clues, he assumes a false identity and manages to slip through the grasp of the enclosing police as he ventures deeper and deeper into the countryside. The closer he gets to his destination and the more people he meets along the way, the less he understands about what he is looking for. Ultimately, he comes face to face with a ring of clandestine gamblers placing bets on the outcome of a multi-player, high stakes tournament of Russian roulette. 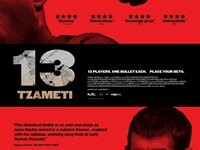 Directed by newcomer Gela Babluani, "13 Tzameti" (pronounced: 'zah-meddy') is a winner-take-all thriller, where an unfortunate young man is transformed into Contestant #13 with no way out save his luck.